What is aHybrid Sauna Heater? A Hybrid Sauna Heater is a Heating System that uses both a tradional Finish rock style heater as well as IR sauna Heating panels. This type of sauna heater provides the most effective sauna heater on the market. A Hybrid sauna heater will causes the user to sweat much quicker and much more than any other type of sauna heater. A Hybrid sauna heater can use either tradional Finish electric heater or IR carbon Fiber panel heaters or the bather can select both for the ultimate sauna experience. When selecting both, a bather will find they can generally get the same sauna benefits in about ½ the time as using only oneof the heating types. Two heating methods! An IR heater uses IR radiation to directly heat the objects in a sauna. This is the same direct radiation that provides warmth when directly in the sunlight. Ever noticed that even in the winter the sun can melt ice or feel warm even while it is still below freezing! A tradional Finish Sauna Heater uses convection to heat up the objects in a sauna room. Convection is the direct heating of air that comes in contact with the heating element. The hot air then circulates through the sauna heating up objects that it comes in contact with. Both methods can heat the body and cause a bather to sweat. However,using both at the same time will provide a double bake and increase the body’s temperature much quicker. A Hybrid sauna is great for families that like both types of saunas. A sauna is a personal preference, some like hot dry saunas, other like wet steam saunas, and others prefer the lower temperatures of IR saunas. Investing in a Hybrid Sauna Heating System will allow family members and guests to choose as sauna style that is right for them. When building a large Hybrid sauna room it is generally better to build a smaller areawithinthe sauna room that is specific to IR heating. IR heaters work like a light bulb and as such the closer the bather is to the source the better the effect. 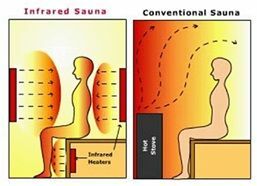 So in a large sauna room rather than trying to fill the entire room with IR panels, it is better to focus or dedicate a smaller area to IR heating so that bathers that want to use IR heaters can do so by sitting closer to the IR panels. Generally placing the IR heaters in the corner of a large sauna room will give the best performance as it can project from two sides. 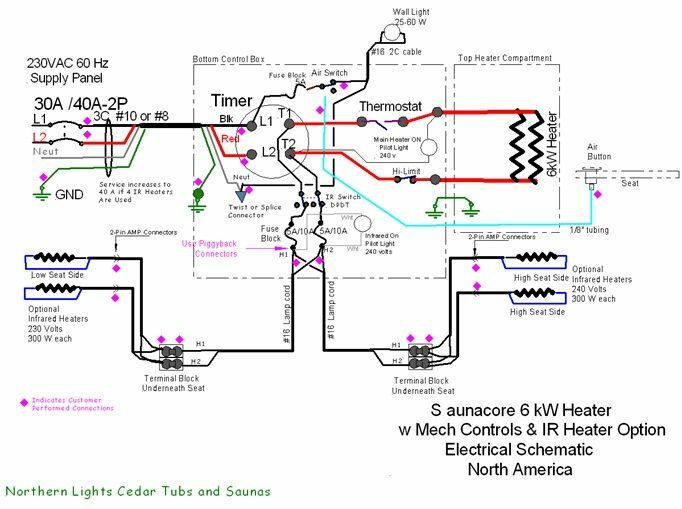 Wiring a Hybrid Sauna Room is easy to do if you purchase a Hybrid ready heating system. The main sauna heater will have a selection control to select electric heater/IR Heater/or both IR & Electric. The carbon fiber IR heating panels are like picture frames that simply mount directly to the wall of a sauna room. The wires are fed back to the Electric heater that contains the contacts for the IR heater leads. If you are looking for the best of both worlds and can’t decide then we definitely suggest you consider a Hybrid heating system for your sauna room. Not only will you have both sauna heating types to choose from but you will also have a sauna room that can heat your body and start you sweating in ½ the time.